Women’s Cycle of Life leader: I love to see that spark in women! I love to see them come alive, and realize that they can learn! That they have talents, that Jesus can work through them to transform their families, and their communities. For many women meeting Jesus through Women’s Cycle of Life, God is truly giving them beauty for ashes. They are new creations in Christ Jesus. Through Women of CHE classes women have the opportunity to learn new skills, as well as refine their skills. Two women have started their own bakeries with enthusiastic support from their husbands. Others are making their own birthday and Mother’s Day cakes, which saves money. One woman added home-made donuts to the snacks she sells outside the school, a step which has boosted sales. Many have taken cake-decorating classes with a government program. The sewing classes in one community began with the village seamstress generously teaching her skills, and sharing her sewing machine. 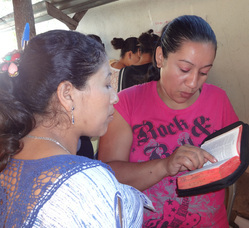 The women came to learn in small groups throughout the week. Recycled secondhand clothing was used for practice. Thank you to all the seamstresses in the US who generously share their fabric stashes so that CHE women can make attractive items to sell, and begin to augment their income. 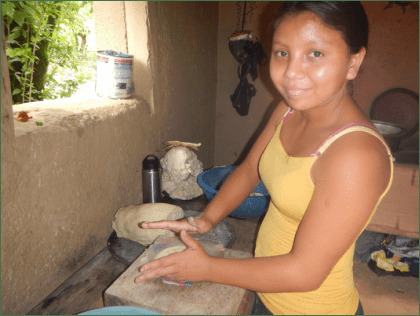 Previous PostCHE Nicaragua Featured VolunteerNext PostWhat Impact has CHE had on the Communities of Nicaragua in 2015?